Consistent, thorough care of your drains is the most effective way to prevent major sewer system problems. If the drains aren’t cleaned regularly, many of the substances that can get trapped and create clogs can cause serious damage to your pipes and present a health hazard as well. To avoid problems like sewage backup or hazardous spills, call Nu Flow Oklahoma for your drain cleaning needs. Our services are top-of-the-line and ensure that our solutions are long-lasting. In part of our cleaning services, we also provide a camera inspection in order to first locate the problem and isolate it. This is a trenchless method, in which we use existing access points or dig small holes to the pipe connections to send our camera through. This camera helps us inspect the conditions of the pipe and determine what the best solution will be. We offer various drain cleaning options to restore your pipes back to functionality, such as hydro jetting and drain snaking to remove clogs and clean the pipes completely. 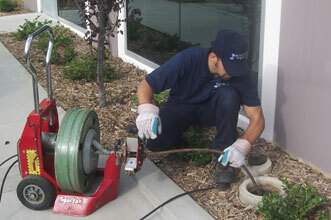 Our team is comprised of experienced professionals who will be able to quickly and easily renew your drain pipes. Preventative cleanings and inspections scheduled regularly will help you stay ahead of future drainage problems by allowing us to catch issues before they can develop into major problems and cause spills and backups in your home. Drain cleaning is a cost-effective, efficient solution to drain problems and ensures that our customers don’t have to deal with expensive repairs or health hazards later on. If you are experiencing a pipeline emergency in Aluma, Oklahoma, don’t hesitate to call us for assistance. We provide the most efficient drain cleaning and repair services in the area and will quickly respond to your needs in a professional manner.